Dude - you are going to put me in the poor house. I just received the Independence CV-62 Island in 700th scale. Holy buckets that is nice!!! I know how you feel Mark! Thanks so much, Miguel, Mark and Walt! And speaking of masts, very happy to announce a set of 1/350 scale cage masts for Colorado class and Tennessee class battleships is now available. Features include detailed supporting structure and service catwalks for the mainmast searchlight platform and ship's bell. Hi Steve, what is the height of your masts and have they been test fitted on the resin kits that are out there? It is very important that the masts lineup even at the top. Aligning fighting tops to fit specific resin kits will be up to the modeler. No two resin manufacturers' Tennessee/California/West Virginia kits are scaled exactly the same. This difference is further exacerbated by resin kit shrinkage during curing. As you know, resin kits' shrinkage during curing is mostly a function of resin mass, therefore shrinkage often noticeably affects larger-scale models, such as battleships in 1/350 scale. * Environmental conditions also affect resin kits' shrinkage rates, meaning that two resin kits' hull and superstructure parts produced by the same resin manufacturer on different days with different temperature and humidity can and do shrink differently. This means that no two Tennessee/California/West Virginia resin kits' superstructures are exactly the same height. Therefore, it is impossible to design a set of 3D masts that will perfectly fit every resin kit since every single one of them is slightly differently sized. The best that can be done is to design 3D acrylic masts to match the scaled dimensions of the masts of the actual ship. That's what these 3D-printed acrylic masts are, perfectly matched to the real mast heights of USS West Virginia. * For example, the sample 1/350 kit provided to me from which to design a West Virginia superstructure, when compared to US Navy BoGP drawings of the ship, was differently scaled longitudinally than it was laterally (smaller longitudinally), and vertically (least difference). Worse, the difference in any dimension changes along the length, width and height of the hull. There is more of a difference at the center of the hull where the mass is greater than at the ends. This tends to indicate that the sample resin hull likely had shrunk differentially during curing, a normal characteristic of resin kits. The hull shrinkage occurred greater longitudinally than it did laterally or vertically. 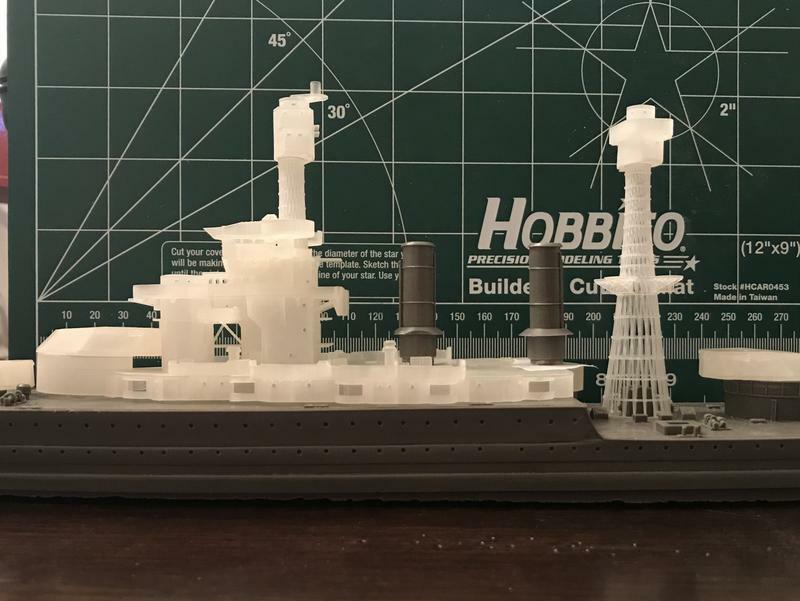 This posed a very difficult 3D design challenge in creating a 3D acrylic superstructure that was intentionally scaled differently in all three dimensions, differently along each dimension, in order to produce a 3D acrylic superstructure that would fit a differentially shrunken resin hull. There is also the consideration of differences that occur during building. No two modelers are likely to achieve exactly the same superstructure height with the same resin kit once parts' casting blocks are removed, etc. Shrinkage is never a good thing! I also have the Blueridge mast that I was very critical of. At first glance yours appears to be more accurately shaped. I don't see any platforms with yours. Is that correct? Steve, just received the Tico mast and pilot house- really sporty!! Now, maybe I can get back to my Cowpens. Shrinkage is never a good thing! Indeed! From a design perspective, resin shrinkage makes my hair hurt. ...At first glance yours appears to be more accurately shaped. Thanks to Martin Quinn who provided high-res photos from the National Archives. An accurate shape and structural member count was achieved by superimposing the 3D design over several of his high-res photos as the design was being created. The members are slightly thicker than scale, necessary to meet printing requirements for strength. Even so, the masts are fragile so please be careful with them as you build and paint. I don't see any platforms with yours. Is that correct? Calling all Baltimore class heavy cruiser fans! In anticipation of future Trumpeter 1/350 scale releases and for those who have the Iron Shipwrights or Yankee Modelworks USS Baltimore CA-68 kits, we are happy to announce a set of enclosed bridges for USS St. Paul CA-73 in 1/350 scale is now available. The set includes directors for both forward and aft superstructures. Sets for both USS St. Paul CA-73 and sistership USS Los Angeles CA-135 are also available in 1/700, 1/600 and 1/490 scales. Indeed it does look pretty darn good. Very much an improvement over the Blueridge version! 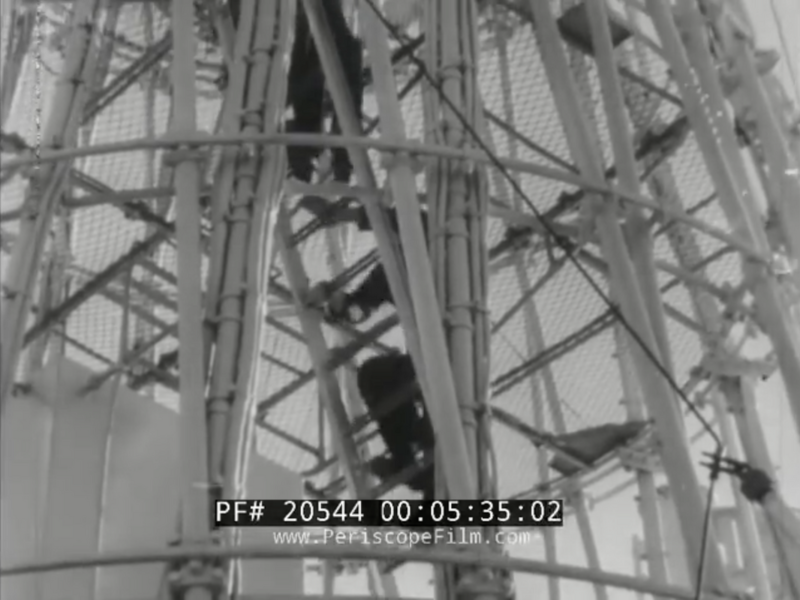 I love the fact that Steve recognized that there were no platforms inside the masts but just netting. Here is a view of that netting. Great photo - not to disagree with your comments, but I would argue that the "netting" is actually a walkable expanded metal platform as there is actually in your photo a rounded edge or lip and that the direction of the metal ribs is consistent with a flat plane rather than a vertical "net". And I think the angled ladder goes up to that expanded metal platform. Comments? I don't want to hyjack Steve's info page with discussions of details. Maybe we should move this discussion to the CASF section? Joining a comparable set already available in 1/350 scale, a set of ten 5"/54 cal. Mk.41 twin-gun mounts is now available in 1/700 scale. Calling all sailing warship fans (USS Constitution, etc.)! Happy to announce another detail for your large-scale models is now ready, Shot Racks and Shot for 32-pounder Carronades. The racks can be cut to length to suit the modeler's needs. Shot are printed on a sprue separately from the racks for easier painting and include small posts for easy assembly after painting. Happy to announce sets of US Navy-type ships' bells are now available in 1/700 and 1/350 scale. Other scales may be possible. Now that I am retired. I can work on these build that I have. Steve have a lot of stuff that I can use. Best wishes on your retirement, Mardis! I hope you'll be enjoying yourself, family and friends so much that you'll need a retirement from your retirement. Happy to announce a 6"/53 cal. Mk.16 turret for Omaha class light cruisers is now available. As always, nameplates with decorative nautical rope border made in real metal (brass, bronze, silver or gold-plated), or inexpensive acrylic for easy painting, of any ship of the class can be designed for your model. There are ready-to-print nameplates for 356 ships to choose from. Oh man!!!!!! Now I can rebuild my 2 Blue Water BBs!!!!!! Thanks, Mardis! I hope you find the new 3D-printed masts to be much better shaped and detailed than those shown in your photos. In other news, happy to announce a set of 1/48 scale B-17 Flying Fortress flaps and flap wells is now available for your classic Monogram and Revell kits. The set is composed of just 4 parts, 2 flaps and 2 flap wells, and presents an attractive alternative to photo-etch sets. A set of 1/48 scale B-24 (PB4Y-1) Liberator flaps and flap wells will be released soon.